Setting the Stage for Summer: Write from the Start! The co-authors of Two Writing Teachers are making summer writing plans, bringing closure to the school year, and preparing for some new beginnings in the fall. So, from today until June 14th, we are turning Two Writing Teachers over to a group of guest bloggers. We will be back next week with new content. Enjoy! As the year draws to a close the goal of being a writer outside of school is put to the test. Summer activities (baseball, swimming, camps, vacations, etc.) present strong competition to all writers and even more so to our young writers. The key is to enable these writers to see how writing fits into what they’re doing and captures their stories for years to come. I have worked to help the writers in our community understand writing does not pause when school closes for the summer, but rather our writing community has given us what we need to be writers who write for ourselves and through writing we can capture the moments of our lives, hold on to them, and inspire others. We have grown as a community through our writing. We have learned to collect our stories and how sharing our voices connects us to the world. Through the Slice of Life Classroom Challenge we realized writing opportunities happen everyday and we can find time in each and every day to write. As a grade level of writers, we Skyped with @AmyLVPoemFarm. Here, we learned the nuances of poetry and the benefits of expanding our community to include the writers in the other first grade classes. Writers shared their heartfelt writing in open space through blogs, screencasting applications, and then taking yet another step as writers, they read their poems to parents and guests at the school art show. I have watched the writers in our community become writers, not just for me and not just for school, but for themselves. I read L’s story about new glasses and how much they help him see far away, and even though they give him a headache, he still likes them. I’ve watched a writer inspire others by sharing the story of his life. Shortly after reading his post I read at least 4 similar posts. I have learned animal facts as A shared his new learning in a blog post. I have witnessed the joy and excitement of students when they received comments on their blogs and replies to their tweets. I have witnessed each and every writer share their stories because their stories matter. Writers want to tell their stories, not because I asked them, and not for school requirements, but for themselves. To help the kids experience other writers who collect and share stories we read Mr. Cornell’s Dream Boxes by Jeanette Winter. In this story Mr. Cornell was a painter, an illustrator and a collector of things. Mr. Cornell used these things and his art to create picture boxes to capture his memories and share the stories with others. As we read this story the kids connected Mr. Cornell’s Dream Boxes to our writing notebooks. 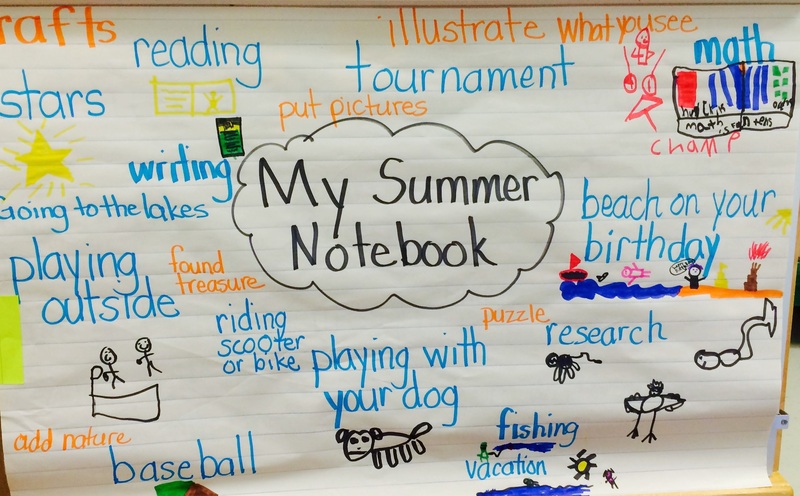 “Our notebooks are a place where we can capture memories just like Mr. Cornell.” This led to a passionate discussion of stories we could write, memories we could collect and how our notebooks would be a great place to write about all the fun things we do this summer. Lois Ehlert’s Scraps gave us another example of how writing notebooks collect life’s moments. Lois Ehlert shares the story of growing up in a creative house where her parents were always creating. Lois tells us how, as a child she collected scraps from both her mother and father as they worked. Later in the book she allows us a peek into her work space where bright colors fill the space, writing tools and beautiful fabrics are all around. Immediately kids recognized the scraps of material from Lois Ehlert’s books. These connections led to questions about collections in our notebooks.- “Can we put things in our notebooks?” The answer, “Of Course!” Instantly chatter broke out, “I can ask my mom for a picture of my dog…” “I am going to ask my mom if we can go to the bookstore so I can buy Scraps!” “Mrs. Frazier what about my ticket to the Reds game?” It was clear the possibility of writing amidst the fun of summer was catching on! Our third workshop kept the excitement level high and added endless opportunities to the writers. We gathered on the carpet to explore the plethora of ideas on @AmyLVPoemFarm page, Sharing Our Notebooks. We saw notebooks by kids and adults, story ideas, illustrations, collections and even photographs in the notebooks. As we read, we began to get ideas for our notebooks. I watched and listened as the writers were beginning to internalize there are no wrong answers when it comes to how a writer keeps a notebook. The notebooks and the writing in them are as varied as the writer. After combing through the possibilities of notebook ideas, writers began to generate thoughts about their writing notebooks. I listened as writers anticipated writing beyond our classroom. One student shared how she was going to get note cards and punch a hole in them so she can put them on a ring as her notebook. Another student shared a journal from his mom he can use, and some students shared plans to write in their digital tablets. Next, the plan progressed to getting cool pens and maybe a stylus for writing. The excitement was palpable, writers were ready for writing. At this point I was simply in the way! So I stepped back and let the writers get to work. The chatter was about organizing notebooks, planning where they like to write and sharing writing over the summer. The room was abuzz and I was in the back watching the writers take flight. They were making plans not for me, not for school, but for themselves as writers. As I shed a tear or two, I am thinking back to where we began our journey as writers. Random marks on paper, a few letters, and maybe words here and there. And now, I anticipate reading blog posts as they share stories and inspire others as they live the life of a writer. I could not be prouder. The stage is set…now the waiting! Deb Frazier spends her days learning alongside amazing first graders in Hilliard, Ohio who are just as eager to learn as Deb. You can find Deb on her blog, Primary Perspective or on twitter @Deb_Frazier or tweeting with her class @Frazier1st. Thank you so much for a peek inside your classroom! What lucky students you have! I am a professional development coach in San Antonio, Texas and was just organizing my writers notebook for the summer. I was thinking of things I wanted to add to inspire some future summer writing soon and then read your post. It made me so excited to think about your students and how I would have felt if I had been in your shoes!!! What a great job you have done and by the way, noticed you are from Hilliard, Ohio where my biggest writing and life inspiration is from… Sharon Esswein!!!! What a great set of skills you set forth for your writers. Can’t wait to hear how they take this on in their daily lives outside of the classroom. I’m sure they will be sharing with you! Love the connections you made to text and the charts you developed. Great visuals to push the writers to live this life. As a newly retired teacher, I am very inspired by all the comments written before me about teachers doing such amazing work around writing with their very young students. I wish I had found this community before I retired since no one in my school seemed to care that much about creating a writing community in my school but I do hope to work with teachers of English Language Learners to help them see that they can be motivated to write as well with the right encouragement. Such good work you are all doing! Deb, I loved reading this post so much! I love your approach with these kids and how you inspired them to write this summer, rather than assigning or asking. Your use of books to inspire them was so smart. What lucky, lucky kids. Love the chart, too! Thank you for your comment. I choose to use the books to help open the window to the many opportunities open to them as writers. I always love seeing all the different way others work and thought my kids might too! I can feel their enthusiasm for writing from your writing, Deb. I have a feeling they’re going to come back to school bursting with excitement for writing. What a gift that will be for their second grade teachers! ometimes blogs just need a human touch! I was wondering if 3rd gr could do the Slice of Life…excited to hear that your 1st graders did! Of course I can arrange for an author to skypes like you did! Finally I wonder what would happen if I taught your notebook mini-lessons at the beginning of the year? I think our notebooks might really evolve all school year long and into the summer! Thanks for all the ponderings your post has me doing! So glad you got to be a guest today. I look forward to following you as I begin my new adventure in a tech bldg with 3rd graders! Hi Sally. I also teach 3rd grade and while my students did not do Slice of Life this year, they did blog using Kidblog. One of my goals is for us to participate in the classroom Slice of Life next year. I would love to share 3rd grade ideas and strategies with you as I continue to learn more about teaching this age level. Good luck with your transition. Thanks for sharing your thoughts. Kids are amazing and I find they rise to our expectations time and time again! Envision what you want blogging to look like and feel like in your community and follow this vision. You and the kids will gain perspective and wider authentic audience! I am excited to see both of you and your kids in our writing community this fall- let’s connect! I have often wondered how this same lesson would go in September. “Writers want to tell their stories, not because I asked them, and not for school requirements, but for themselves.” It is so clear how you empowered your students all year so that they could continue their writing journeys over the summer. Great post, Deb! Preparing our students for their writing journey is the easy part. It’s the waiting and wondering over the break that is most challenging! Thanks for your comment, I am still in AWE to see my writing here on TWT!! What a beautiful invitation for your students. Introducing a notebook to collect their thoughts during the excitement of summer is just perfect. It will make their notebook theirs, not a place that a teacher makes them write. I love how they are collecting ideas of how to make their notebooks personal on the inside. The stories they might find in this notebook next year will be rich. Thank you for sharing. You have opened my eyes to a possibility I hadn’t yet thought about! YES, these notebooks will be great for fall too! If only I could get these notebooks into my upcoming student’s hands! What a great idea. There was a Writer’s Symposium for our third graders on the second to last day of school. They each got a journal and plenty of inspiration to Write On All Summer! I would love to here more about the Writer’s Symposium! Have you written about it anywhere i can visit? I love that you have introduced your writers to the idea that they write for themselves and that writing does not pause when school ends for the summer. Giving them the tools to become lifelong writers is as wonderful as giving them the tools to become lifelong readers. How lucky your students are. I am not familiar with either book- thank you for the titles. Am adding them to my list of books to explore this summer. Thank you for stopping by and taking time to comment. I am eagerly anticipating the stories of their summers, not because I asked, but because they want to tell them! I hope you enjoy the books they’re both new to me this year, but they will be mentor texts for years to come for me! I love this line, “Writers want to tell their stories, not because I asked them, and not for school requirements, but for themselves.” That’s the key! They see themselves as writers!! This is such an inspirational post! Thank you for sharing and happy writing to your first graders! I appreciate your comment and love that our story inspires you. It’s every writers hope that our story paints a memory in someone mind! Deb, I am amazed with all the great plans your young writers made as you guided them to see the possibilities with beautiful mentor texts and the Sharing Our Notebook page. (I love Scraps but was unfamiliar with Mr. Cornell’s Dream Boxes- added it to my Goodreads list!) Even more, your work together all year has set the stage for them to now continue independently and with purpose,which is what we writing teachers can only hope to accomplish. I taught kindergarten for many years and moved to third grade this year where my students began blogging. I honestly didn’t think kids much younger than third grade would be able to blog, but reading your post has shown me that they can. I was thinking how powerful it is that children in first grade are bloggers and what that must do for their writing identities moving forward in school. You wrote, “I could not be prouder” and it is clear you have every right to be proud of them and your hard work getting those emergent writers to be such purposeful, enthusiastic writers! Well done and great post. WOW! Your comment was my first comment on TWT and what a comment it is, you’re making me blush! 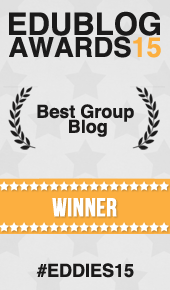 Our writing community has been intrinsically motivated from the first comment on KidBlog! You will be amazed when you see what open blogging can do to the motivation of a young writer. They are brave, they don’t know the ugly truth about editing and they let their little fingers hunt and peck out the perfect message each time! The hardest part is to remember the writing should look like it came from the writer not the adult. Parents need this reminder too as adult edited post can stifle other bloggers! Looking forward to following your class and Sally’s this fall- Lets all connect!